Flew over the Andaman Sea, crossed the Bay of Bengal and then the Arabian Sea. 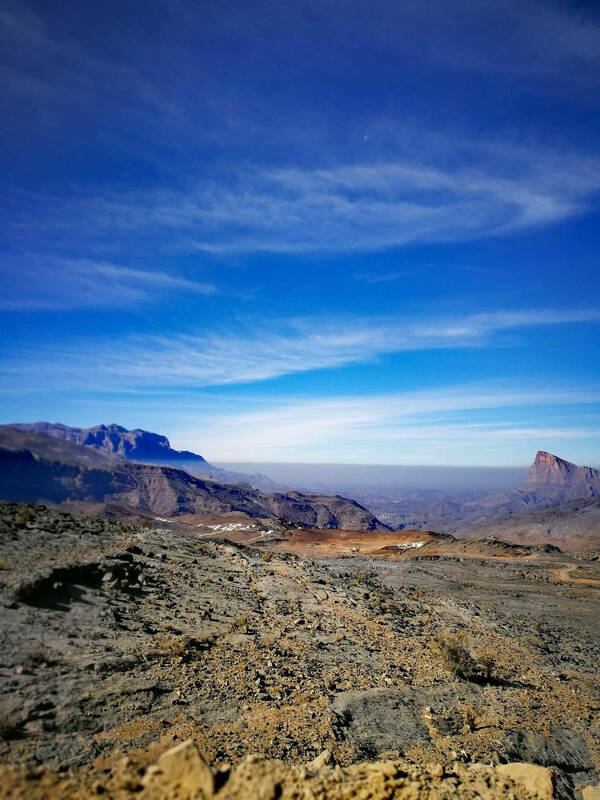 Oman, a supposedly safe haven in the Persian gulf bestowed with breathtaking landscapes and beautiful culture had felt like an unlikely destination. Political unrest and tensions have left many misunderstood destinations barely discovered. A pity, because there are so many places to visit in Oman. Despite the trepidation, a part inside me was feeling the thrill of uncovering the beauty of this gem most often surrounded by a sense of mystique and allure. Flying in with my family of four from Thailand to reunite with our other family from the Mediterranean Sea. Meeting midway across the globe was what brought me here. My whirlwind romance with this beautiful country steeped in tradition will begin in Muscat. Find out what to do in Oman and the best places to visit for a perfect trip. Discover Oman cities from the capital, Muscat, its natural landscape and architecture. The drive through the capital in Muscat was a remarkable sight. Spotlessly clean city with neat rows of hedges and date palm trees lined up on both sides of the road. The cleanliness, modernity and order reminded me of Singapore where I grew up, except that the views here are surrounded by picturesque mountainous rock terrains. Overlooking from atop the terrains on the criss-crossing highway, the city is scattered with neat rows of low-lying white houses and monuments. In Muscat, buildings are consistently painted white to preserve its historical aesthetics. At a temperature of 21 degrees, December is the best time to visit this beautiful city with a perfect blend of tradition and modernity. Below some of the best things to do in Muscat as well as day trips to enjoy perfect Oman holidays. Islam is the way of life in Oman. The Omanis developed their own form of Islam called Ibadhism during the 7th century AD. Not all Omanis are Ibadhis, there are the Sunni and Shia Muslims as well. The Omanis, in general, are tolerant and respectful of other Muslim communities and believers of other faiths. A trip to the Grand Mosque located along the Sultan Qaboos Road is one of the best ways to see the daily lives of the Omanis. 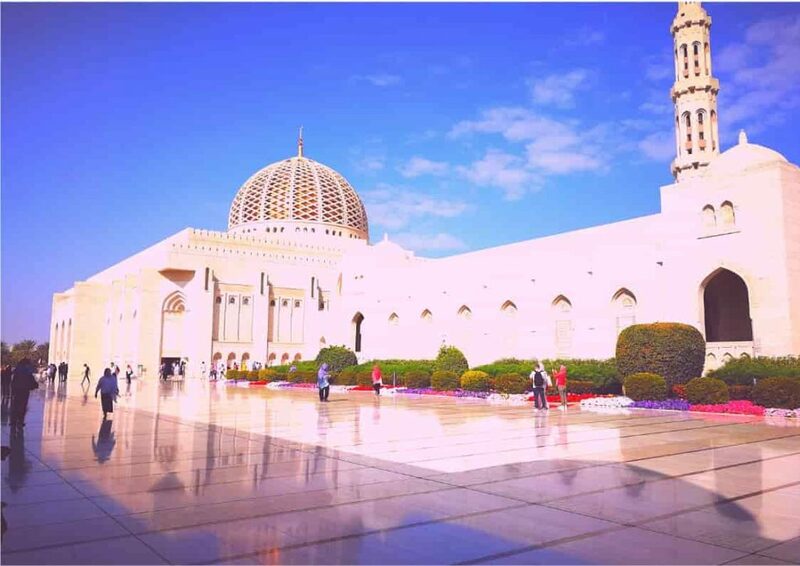 With a sheer capacity to house 20,000 worshippers, the Grand Mosque is undoubtedly a glorious showcase to one of the most important modern religious landmark in Oman. Its beauty and extravagance was a result of a mix of aesthetic styles inspired by Islam, the Middle East and traditional Omani architectures. The mosque interior is embellished with geometric mosaic patterns with the most delightful of colours. It is also home to the world’s largest crystal chandelier with 600,000 Swarovski crystals and the largest Persian rug which involved a staggering labour intensive effort of 660 Omani women to hand made and complete over 4 years. Entry to the grand mosque is free and is the only mosque opened to foreigners to visit every day except Friday from 8 am till 11 am. The dress code is conservative for both men and women. Long pants, long sleeved tops with non-revealing fabric. A headscarf is obligatory for women to enter the mosque. Any scarf at home can be used as a veil to cover up the head. Shoes are kept at designated shoe cabinets before entering the mosque. A galore of artefacts, antiques, spices, shimmering silverwares and ethnic jewellery displayed in over hundreds of shops along a labyrinth of narrow alleys. 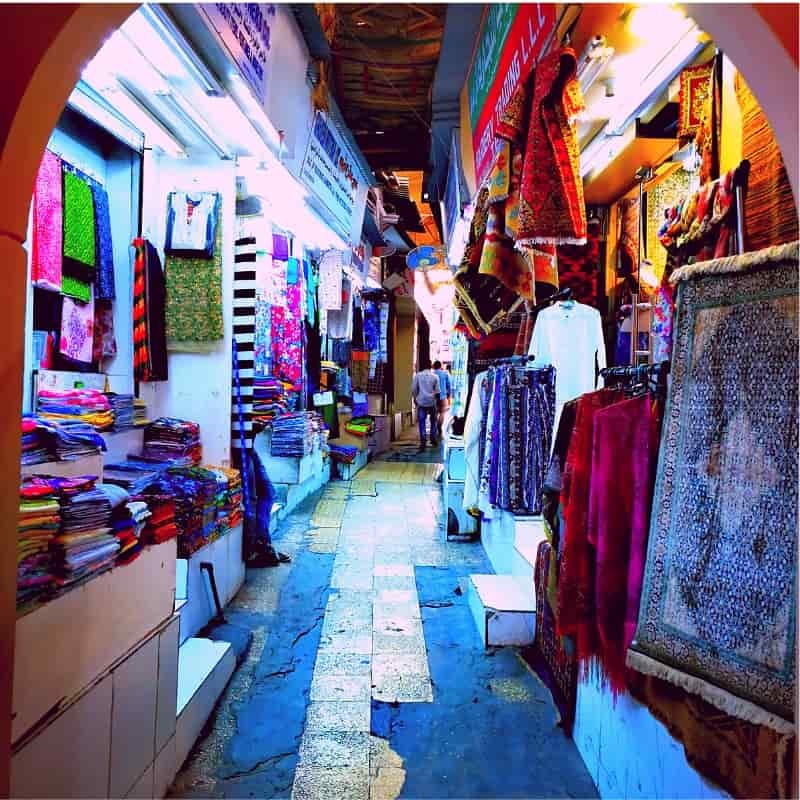 Muttrah Souq is Arabs’ oldest trade bazaar since the age of sail. Housed under timber roofings, evidence of early settlements dates back as early as 3,000 BC. During the day, the souq is laid back but springs back to life nearing dusk. Merchants here are most often seen flexing their haggling abilities with dexterity. Over 200 years old, the chaotic ambience of an old Arab market remains intact under the nostalgic aroma of frankincense. Like us, many people come here to see the souq. To see an Omani’s life in Muscat as it is. Towards the end of the souq in the direction heading towards the Sultan Qaboos Port is a worthy trip to the local fish and vegetable market. The new fish market was built close to the port providing an economic boost to the local economy. A haven for seafood lovers, you will find here a wide array of fresh fishes caught off the Gulf of Oman on a daily basis. Local delicacies from tuna, snappers, swordfishes to sharks are all housed and prepared in clean and well-conditioned modern facilities. There are of course fresh fishes available in Muscat supermarkets but nothing comes close to those available at the Muttrah fish market. 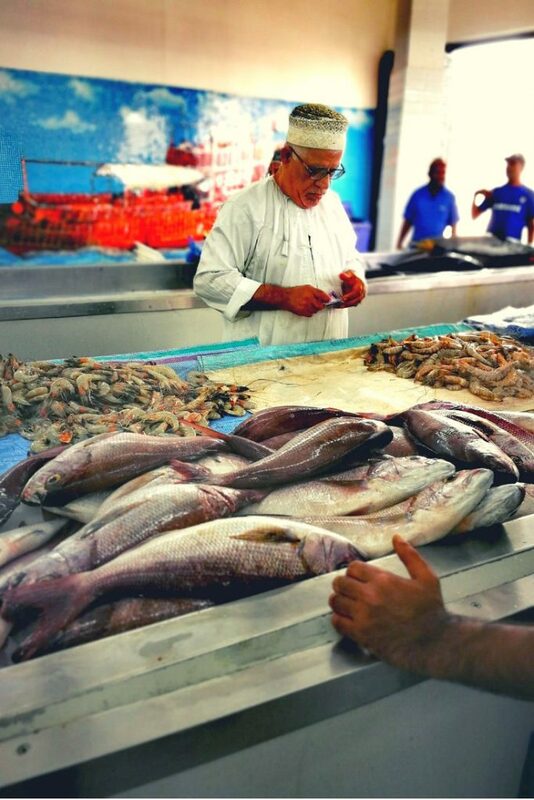 As a tourist, the Muttrah fresh fish market is another opportunity to experience local life in Oman up-close. 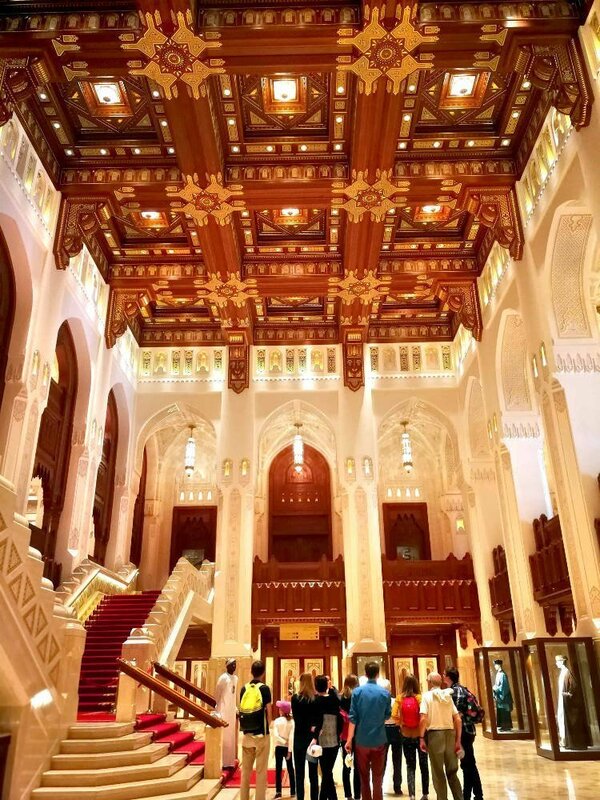 Tiled in white Omani marble on the outside, luxurious Italian white marble and Myanmar teak wood finishing on the inside, the Royal Opera House is a glaring architectural masterpiece and home to countless international performance arts, events and musicals in Muscat. Opera on Ice, a spectacle of a combination of singing and ice skating was one of the many international performances staged here. The opera house is open to the public for viewing on a daily basis. Box office seasons commence in September through June the year after. Tickets are available both online and walk-in foot traffic. Formal business wear is strictly required of patrons visiting the opera house and punctuality is widely emphasized for all shows at the royal opera house. All details of shows are available here. The Omani Sultanate was historically an important empire for trade in the Middle East from Straits of Hormuz to parts of India. This trade influence in the region hence played a pivotal role in shaping the Omani traditional food culture. Spices from India and East Africa can be found throughout Oman and in some Omani dishes, coconut milk is used. Besides meat, and typical of any Middle-eastern cuisine; fishes are frequently consumed in Oman. This is largely due to Oman’s long stretches of coastlines and fertile seas. With the abundance of fishes and sunshine, dried fishes in particular are very popular here. Dried limes, lemons and animal oil are also used frequently to add flavours to their local cuisines. Omani food, in general, is usually an exquisite blend of flavours infused with Omani and the Gulf’s cultural style. 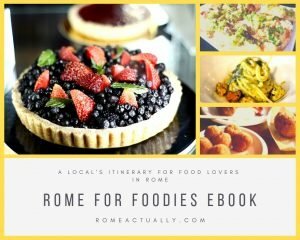 However, it can be a bit challenging for travellers with a not too adventurous palate. In Muscat, we stumbled upon Kargeen. A restaurant built in wood and wrought iron on the exterior. Beyond the entrance, the whole restaurant is brightly lighted up with traditional Arabic lanterns and flooring adorned with bright Persian rugs. Kargeen exudes an ambience of elegance in its ethnic settings and best of all, serves up delectable homemade cuisines consisting of a vast combination of Omani, Middle-eastern and western menus suited for the most discerning of palates. If dining beneath a myriad of stars under the canopies is what you are looking for, Kargeen is your go-to restaurant in Muscat. If I were to describe our day at Daymaniyat islands using the colour wheel, it could only be turquoise and azure blue. An hour of sail on Muscat high seas, this paradise captures our hearts with the most alluring of pristine waters framed by an endless stretch of white sand. Despite the chilling wind, it didn’t take us too long to gather our snorkelling gear ready to plunge off our boat into the waters. Schools of eels, fishes and beautiful corals made up our views beneath the boat. A group of sea turtles and stingrays were spotted shortly after. We trailed behind these magnificent creatures, losing the sense of all the time in the world as we marvel at their beauty and grace. The Daymaniyat Islands are highly protected marine reserves due to its richness in biodiversity. It is home to droves of indigenous marine wildlife, waterfowl and migratory birds. Every year, thousands of sea turtles come on shore to lay and nest their eggs. Whale sharks and dolphins are common sightings here as well. Daymaniyat Islands will be deeply etched in our memories. It was an unusually beautiful day. Best way to visit the islands is to hire a local operator. Access to the islands are chargeable and varies depending on whether you are a local or foreigner. A license to enter the islands authorised by the Omani government is required. The operator will take care of all administrative work, boat rentals, provision of snorkelling equipment and life vests for the trip. For us, we prepared our own full face snorkelling masks (not suitable for kids 5 and below) and fins for our kids purchased from a sports store, Decathlon. It made the whole snorkelling experience for young kids more pleasant and less stressful. The waters can be really cold so a snorkelling wet suit for kids is highly recommended. For a more exclusive experience, operators can arrange for lunch in tented canvas shades on the beach. Our lunch includes barbecued fish freshly caught off the waters prepared by the locals. Dominated by mountains, flanked by oceans and deserts, Oman is a tapestry of ever-changing terrains and landscapes. There is really no better way to immerse in them all than to buckle up your seatbelts and take on a road trip. From Muscat to Sur, a relaxed 2-hour drive (my husband is the one driving, not me) covering 200km has one of the most scenic views for everyone to marvel at. It is a spectacular sight to behold. Cars hired from airports and/or hotels are equipped with automatic transmission. Road signages are in English and Arabic. As a precaution, do download digital maps in advanced in addition to your roaming subscriptions. Petrol kiosks are aplenty but the smaller ones only accept local cash. Sur is a sleepy seaside town. Streets in the old town at Al Ayjah are quiet in the morning with little signs of activities except for a handful of odd goats and donkeys crisscrossing along narrow back alleys. Children donned in Omani costumes playing outside of houses embellished with ornate door carvings. A handful of houses here have also been converted to home museums to attract tourists but with little signs of success. 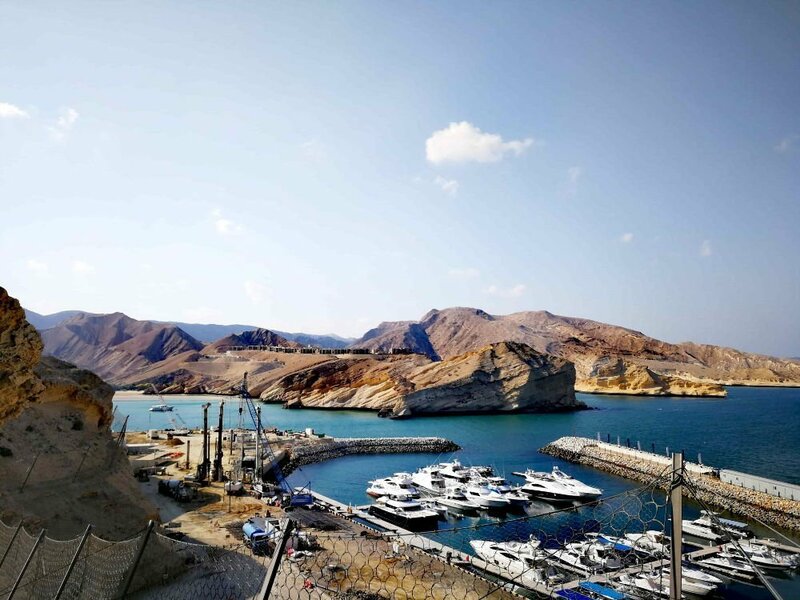 This unassuming quiet port city located on the eastern tip of Oman is steeped in its marine heritage and once played a pivotal role in Oman’s maritime past with its shipyards. Till these days, the enduring tradition of handmade wooden boats is still being produced here. The maritime museum showcases some of their most impressive ship exhibits. Authentic handmade items are also available for sale from its souvenir shop. Basking in an oasis in the desert is the best respite you can have after a long drive. You know you are approaching one when you start seeing obvious signs of life sprouting from plants and palm groves. In Arabic speaking parts of the world, a Wadi is used to describe valleys, dry creeks and river beds in the Middle East. A Wadi could be a stream of fresh flowing water during the rainy seasons or a dry ravine for the rest of the year. 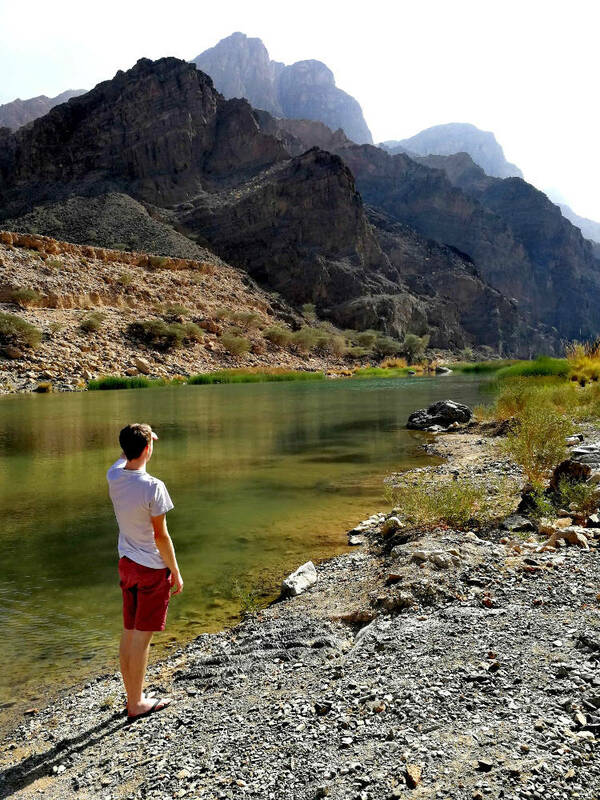 Heading to a Wadi is one of the top things to do in Oman. There are many Wadis in Oman and each one is unique. An enjoyable lunch over a picnic is a favourite activity in the Wadis. Wadi Shab is located in the Al Sharqiyah region in Oman and bestowed with evergreen emerald waters engulfed in mesmerising deep valleys and gorges. Its main attraction, however, is the waterfall in the submerged cave. You will take a 5mins boat ride from the entrance of Wadi Shab that will cost 1 Omani Rial per person for a 2-way trip. The ride will bring you deeper into the wonders of the valleys surrounded by rugged rocky cliffs and beautiful palm groves. Here you will start your 45 minutes leisure walk followed by swimming in a series of pools before reaching the cave. To enter the cave, you need to swim or snorkel through a narrow slit between the mountains. The submerged cave is equipped with ropes for climbing up the waterfall for a jump off into the pool. Wadi Shab will always have a place in our hearts for its ethereal beauty. The weather was cooling at Wadi Shab at the time of our travel but do pack sun-screen, food, snacks and plenty of water. It is OK for ladies to swim in their usual swimwear. But bring a towel along for cover-ups when changing. There are no toilets inside the wadi. Good walking shoes for trekking and non-slip waterproof shoes recommended if you are planning to head towards the cave. The pools which you need to swim through to get to the cave are surrounded by slippery limestone rocks and pebbles. I slipped a few times from the low rocks. I was lucky not to break an arm or leg. So keep yourself safe by being equipped. A word of caution for those planning to head into the cave towards the waterfalls. It is a submerged cave and the water levels can be high. You need to be an able and confident swimmer to get through the dark narrow slit between the mountains. My 8-year-old girl went through the slit and she is a regular advanced swimmer. I do not recommend such attempts for children unless accompanied by adults who are confident abled swimmers themselves. At the top of our voices, we sang to the tunes of Arabic music drifting from the car radio. we giggled and broke into short spasms of laughter for every bumpy ride, big or small encountered while driving through the dunes. We drove past camels nomads’ tents and rugged jeeps spotted from miles away attempting adrenaline high dunes bashing activities. Sur is also the entry point from Muscat to one of Oman’s magnificent deserts, The Wahiba Sands. Before heading into the dunes, We met up with our Bedouin guide, a nomadic Arab who led us to a local car mechanic where the tyres were deflated to a certain point under his close supervision. Once our cars were ready, we trailed behind the guide’s vehicle before the well-paved asphalt roads we so accustomed to disappeared. Here we are, on the sand tracks surrounded by vast stretches of sand dunes glowing in shades of marigold and tangerines under the gentle hues of the sun. The Arabian Desert is the traditional homeland of the Arab desert dwellers. The Bedouins and their origins stretched back thousands of years ago across the Middle East and parts of North Africa. The Bedouins generally fall into two social classes. Those who live as nomadic shepherds, sometimes known to raid caravans crossing their paths while journeying across the barren lands. The other group embraced farming and led settled lives on the edge of the desert. The Bedouins lived in portable black tents made from woven goat hair and relied solely on camels for transportation. Livestock exchanges remained their main sources of income till this day. Their main food source is dairy products consisting of milk from goats and camels made into butter and yoghurt. Meat is rarely consumed except for special occasions like ceremonial events or wedding feasts. They have no permanent homes, limited material possessions and are constantly subjected to the brutal weather of the deserts. In Oman, urbanisation is creeping towards the deserts. Many desert dwellers were displaced to make way for modernisation. 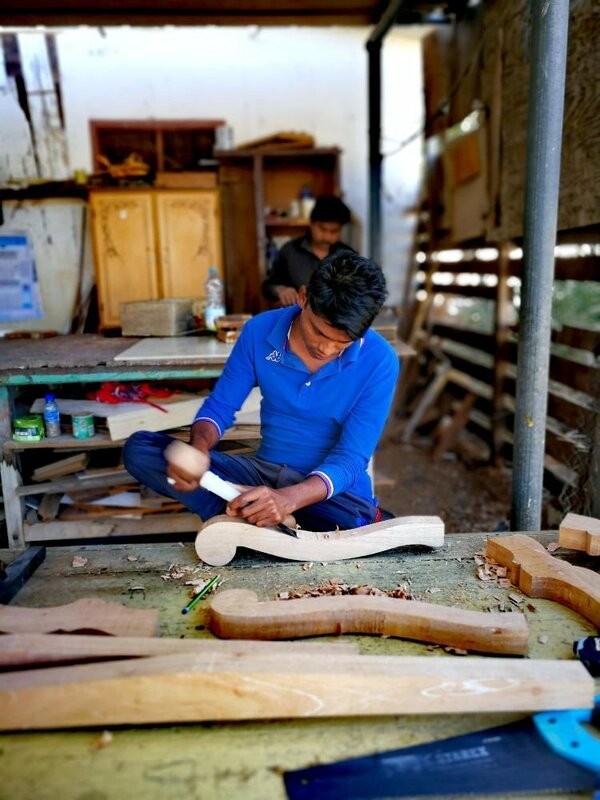 Young people are trading the Bedouin culture for a more comfortable life and better working opportunities in the big cities. There is always a dilemma between racing to catch up with the world and to preserve the Bedouin culture amid threats of modern encroachment. As dusk falls and the temperature drops, the night came alive as delightful Persian lamps and trinkets lit up. The tinkle of wine glasses, traditional Bedouin music and the swell of conversations filled the night at the restaurant. Adorned with low tables, crimson shades of traditional Persian rugs and under the constellation of stars, we dined to our hearts’ content. Feasting on Middle Eastern, Omani and International gastronomic delights, it was fireworks, thousand over miles away from home. 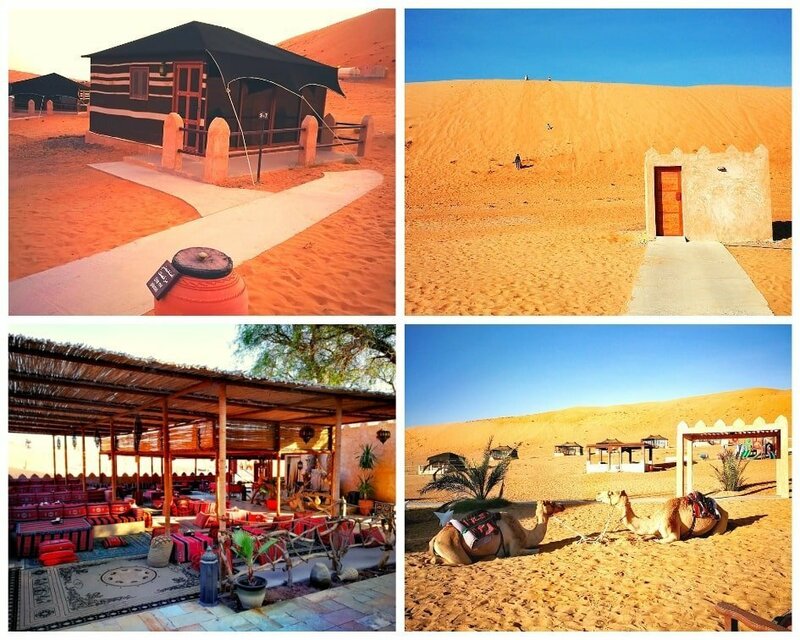 1000 Nights is a desert campsite with traditional rustic tents in nomadic Bedouin style. 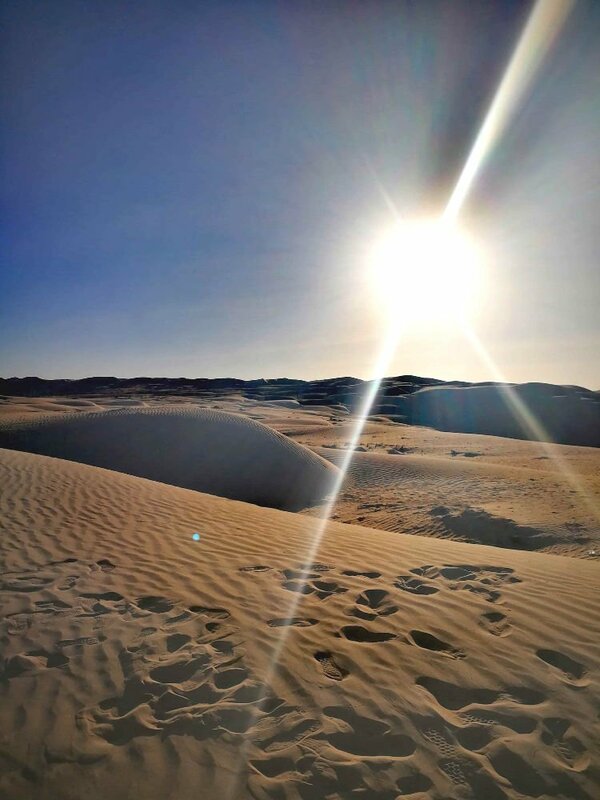 Located 40mins in Wahiba Sands among the rolling sand dunes, its complete isolation made it the perfect place to enjoy the blissful quiet of Wahiba Sands. Atop the golden dunes behind the camps are where the most beautiful sunsets and sunrises were sought after. It is the only desert camp here that comes with its own swimming pool. A variety of family-friendly activities from camels riding, dunes trekking to a guided trip visiting the homes of a Bedouin are readily available here. We left the allure of the deserts the next morning before the scorching heat of the sun took over. 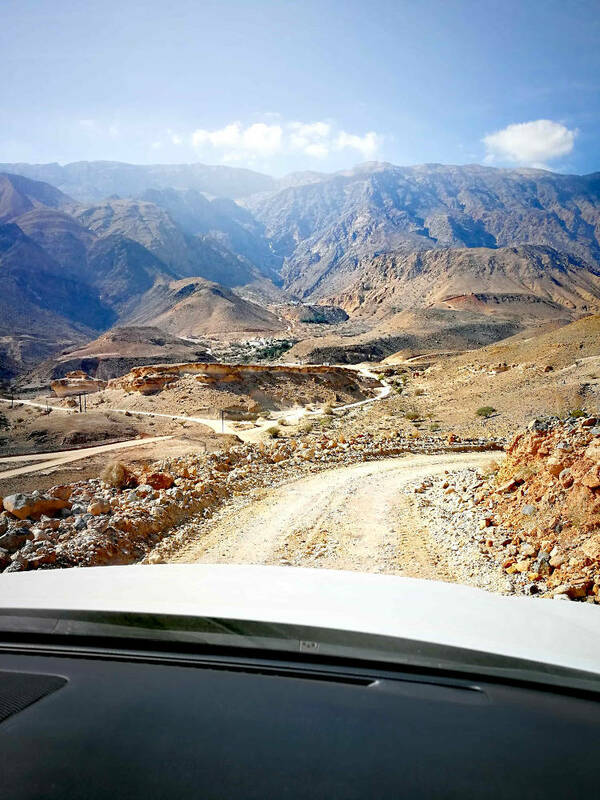 At a soaring altitude of 3,000m, here is where the first sunrise in Oman is received on the Hajar mountains range. At Jebel Shams, also known as the Mountain Of The Sun, you will immerse in the view of a spectacular rip in the Earth’s surface caused by the continental plates meeting head-on and thrusting the ocean bed up at an acute angle that had been intricately carved out millions of years ago. Looking ahead, there are vertiginous points of uncertainty. Looking back at the paths once crossed, it looked utterly impossible but for the most parts, the walking paths are away from drops and the trail is almost entirely flat. This was the trekking route we took at Al Nakhur Rim Hike (W6 route). It is highly recommended for casual hikes through the rim of the Grand Canyon. It starts from Al Khitaym village which is located at the end of the road at Jabal Shams and is just right at the edge of the canyon. It comes with jaw-dropping views, lone goats peering from the other side seemingly guarding the Grand Canyon and an abandoned village tracing the remnants of life abandoned 40 years ago at Sab Bani Khamis just right at the bottom of the balcony walk at the Grand Canyon. The 2.5hours hike is suitable for all levels. My daughter and son both had a joyous hike throughout. Jebel Shams is 250km away from Muscat. Accessible from Al Harma village and is a 2hour drive from Muscat. Roads are well paved and easy to drive on but 4WD cars are highly recommended due to steep mountain roads that can occasionally be washed out from the rain making it impassable and challenging for small cars. The winds and the clouds had conspired to shield us from the heat of the mid-afternoon sun. Surrounded by a canary yellow of an 11th-century ancient fort, The atmospheric ambience was heightened with the hauntingly beautiful voice of the muezzin calling for prayers from the towering minarets. On our way getting to the top of the enormous earth-filled stone tower, We walked through the dark and narrow zig-zagging staircase with each turn met with an opening previously used for pouring boiling oil onto fort invaders. Housed within the fort is a museum tracing Nizwa’s distant past. Heading towards Al Husn Nizwa castle from the fort, were a series of public and private rooms for the use of the Iman, his family, guests and guards. The enclosures were fully equipped with prayer rooms, a library for religious scholars, kitchens, date stores and prisons. A leisure walk along the village brings you back to Nizwa in the olden days with traces of abandoned mud houses, buildings and roads Nizwa is the historical heartbeat of Oman. Previously the capital of Oman in the 6th and 7th century, Nizwa was led with hostility by conservative religious leaders and had remained so till the mid 20th century until Nizwa’s revolt against the Sultan of Muscat took a setback. Since the 1970s, Nizwa had modernised quickly under the new rule while retaining its traditional character. Located in the Hajar mountains, Nizwa is the second most visited city after Muscat. Nizwa is renowned for its silver craftsmanships in handcrafted traditional khanjars (daggers). 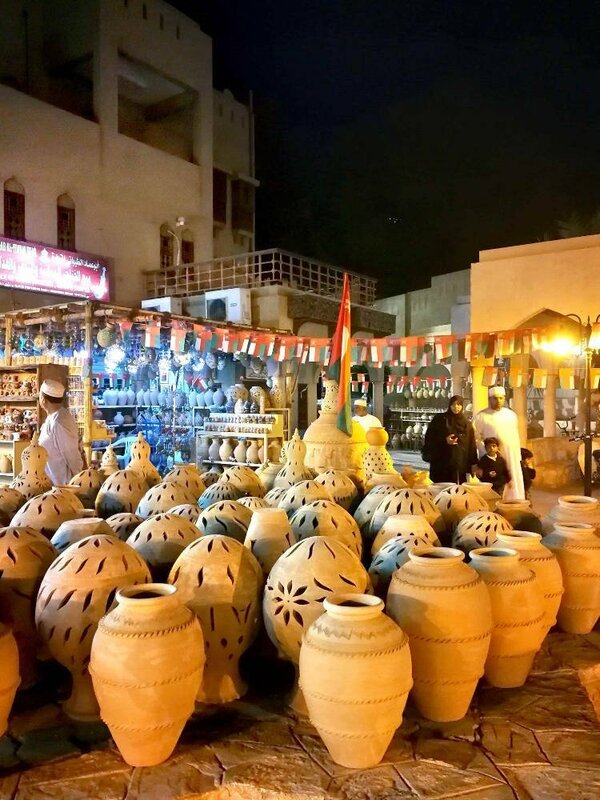 The traditional souq at Nizwa is a good place to pick up some really nice pieces. The souq is also a great source for antiques, the Maria Theresa Thalers that were first minted in 1741 for world trade use, could be found here. Dry food products like vanilla, saffron, spices, dried lemons and nuts of various sorts are worthwhile purchases as well. It also housed some of Nizwa’s prized dates at highly affordable prices as compared to buying them from Muscat. The world’s most ancient and fascinating form of trade re-enacts every Friday mornings as early as 5.30am at Nizwa livestock market. Here, prized livestock like goats and cows exchanged hands. Hundreds of traders and buyers surround the enclosure near to the entrance of Nizwa Souq while domestic animals were being paraded and exchanged for cash. The atmosphere is chaotic with lots of shouting and handclaps as traders and buyers negotiate and bid for the exchange of their animals either for meat, breeding or for the most part, investment. Bedouin women in full veils and masks are often seen here assisting their husbands while the men are in charge of the bid and pay process. A few unwillingly goats and cows are usually dragged around the plaza with interested buyers coming forward checking the animals meticulously. A price is named. The auctioneer walked off to find the highest bidder to exchange the animal for cash. At 10 am, the crowd dispersed off only to repeat the whole process the following Friday. Our 9-day trip to Oman was exhilarating. There were absolutely no dull or unsafe moments and we met some of the kindest souls on earth in this foreign land. Oman’s tapestry of varying landscapes and terrains left us in awe. Their beautiful culture and enduring traditions opened our eyes and hearts to discover more of what the most often misunderstood Middle Eastern regions have to offer to travellers. We hope to be back in Oman. And to explore more of the Middle East with open hearts in the near future. 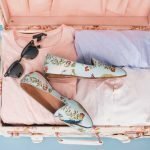 Author’s Bio: This travel article is written by Joey Ho Meng Guet from Flee Me A Trip, an online portal dedicated to authentic travel for families in Asia. Joey is a Singaporean who enjoys travelling and chronicles her family travel stories. She has worked with various travel media and partners in Asia to research and curate travel content to a wider audience on the digital platform. She hopes to create cultural and social awareness of the places she travelled to through her writings.